Stenciled ceiling. Interior design by Julie Couch. Photo by Caroline Allison. Stenciled metallic finish with crystal details. 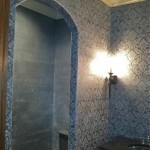 Raised metallic plaster stenciled finish with crystal gems. Stenciled floor by Bella Tucker Decorative Finishes. Custom designed stencil. Interior Design by Julie Couch. Stenciled pineapple finish. Interior Design by Julie Couch.